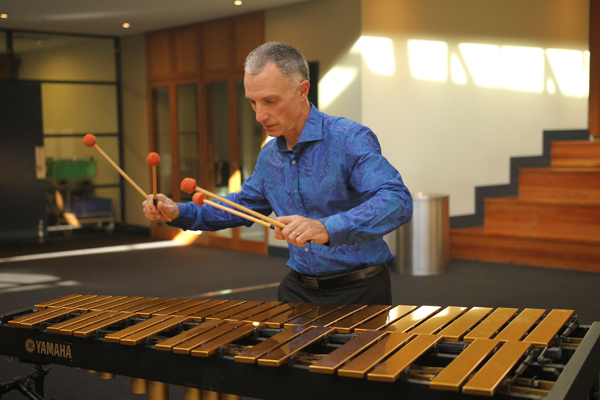 Following their successful collaborations last year with Indian tabla master Pandit Abhijit Banerjee, and then Sandy Evans and Sai-Sarangan Ravichandhira, Tripataka are presenting a concert with another special guest, Sydney vibraphone maestro Daryl Pratt. Together they will perform original compositions by the ensemble, including world premiere performances. An expatriate American, since migrating here in 1985, Pratt has worked in both contemporary classical music and jazz. In addition to his jazz quartet, Sonic Fiction (which recorded on Tall Poppies and NAXOS in the 1990s). He was also a member of the Australian Art Orchestra (1994-2001), AtmaSphere (1991-2003), and the Chad Wackerman Group (1997- 2006). Adrian Sherriff (bass trombone, percussion), Jonathan Dimond (electric bass guitar, percussion) and Adam King (drums, percussion) together with special guest, Daryl Pratt (vibraphone).